How's your body language? It's part of what makes your speeches and presentations come to life! 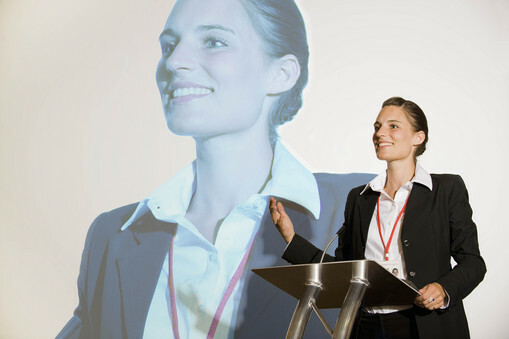 Discover the 5 key body language techniques of public speaking. Of all the communication skills available to you as a public speaker, how important is body language? The answer: as important as any single element of your speeches or presentations! Do you know that audiences judge you based on what you show them? Boost your stage presence! Download my free cheat sheet, "5 Secrets of Powerful Body Language." Consider that the most important visual you can show an audience is yourself. Add the fact that your voice is produced physically. The result? The way you look and sound are hugely important concerning whether you're successful as a speaker. And that includes your audience's physical responses to you, even though they're largely subconscious. At The Genard Method, body language has always been a key element of our executive speech coaching and team presentation skills training. Below are 5 key areas in which your physical expressiveness can take your own talks from mundane to memorable. Learn them if you want to practice powerful body language techniques for your own public speaking. You should begin in a neutral position with hands at your sides. That may feel awkward at first, but it looks fine to people watching. It's what helps keep you open to your audience, so that influence flows freely in both directions. Gesture sparingly, using defined or "clean" hand movements. That will help make them strong. Follow the NODS formula, and your upper body movement will always support and amplify what you say. 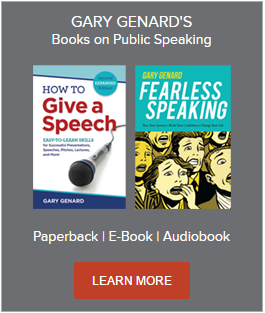 Learn proven techniques that can make you a more dynamic and engaging speaker in my e-book Body Language to Look and Feel Confident. When you speak in public, a certain amount of space on the stage is yours by right. You should claim it! Leaders know how to project power by the way they stand and move; and of course, when you speak in public, you are a leader. Learn how to occupy space in a way that proclaims you are comfortable in the spotlight. Nothing demonstrates speaking for leadership like a presenter who is at ease in his or her own skin in front of an audience. Let's face it: you showcase yourself to the world every day of your life. Show listeners they can have confidence in what you're saying by commanding the space around you. Don't overdo it, but don't minimize the area through which you move. Need a reminder of a speaker who knew how to move as a leader? Here's my piece on Bill Clinton's compelling body language. There's a saying in the theater that good actors use props, and bad actors are used by their props. This isn't just a witticism. Inexperienced performers are flummoxed by a 'property'—a cigarette holder, a wine glass, even a sword or a gun. Solid professionals, on the other hand, understand that the prop exists to help them define their character for the audience. So they use it in a way only that character would. When you deal with objects as a speaker, whether it's a remote clicker or a handout or the screen itself, find a way to help that object give what you're saying impact. The tool is there to help you get your message across. Just remember it's only a tool, and you're the influencer in the room. 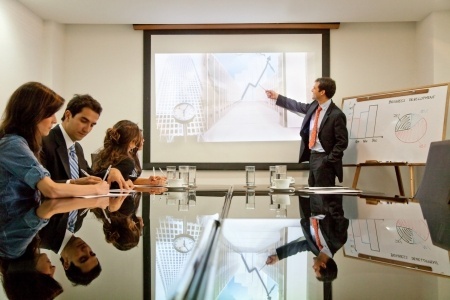 Here's more on how to energize your PowerPoint presentations. We might call this one the "forgotten relative" in the body language family. Yet the human face is vital to communication, from recognizing another person to understanding the subtle clues that underlie motive. Audience members depend upon your facial expressions to augment meaning. So you should definitely be using your face to discover how to be a more expressive speaker. If you don't have an expressive face, work with a mirror. It will help you create a link between what you're trying to express, and whether you look like you mean it. Practice giving your entire talk without a sound coming out of your mouth, even though you're forming the words. Try letting your face do all the communicating. Then practice speaking normally—you'll almost certainly look the part better. As I mentioned above, your voice is produced physically. So it's obviously a component of effective body language. 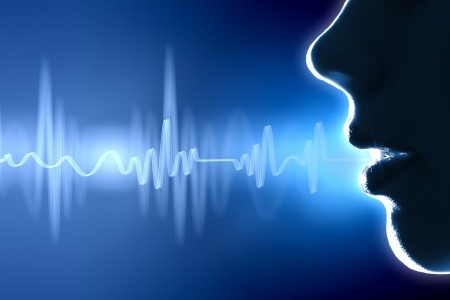 In fact, aside from your brain, your voice is the most flexible communication instrument you own. So you should learn how to use your voice to influence others! I don't mean that only in terms of voice and speech improvement for more pleasant and powerful speaking. I'm also referring to the many ways vocal expressiveness helps you indicate meaning and intention. Listen to speakers good and bad, then listen some more. Take a voice and diction course. Or work with a speech coach, preferably one who trained as an actor. A motto I've used for years in my own speech coaching is "Find Your True Voice." Literally and figuratively, it can make a radical difference in whether your real message is heard. Finally, one study offers the possibility that you can consciously strengthen your power as a speaker through a specific body language technique. It has to do with social psychologist Amy Cuddy's research into "power poses." Cuddy discussed her findings in her TED talk, "Your Body Language Shapes Who You Are” (which happens to be the second most-viewed TED talk ever). According to Cuddy's research, assuming a powerful pose before participating in a high-stress situation demanding peak performance increases one's level of testosterone (the dominance hormone), and decreases cortisol (a stress hormone). In other words, assume a power pose and you’ll feel more able to control the situation and experience less stress. 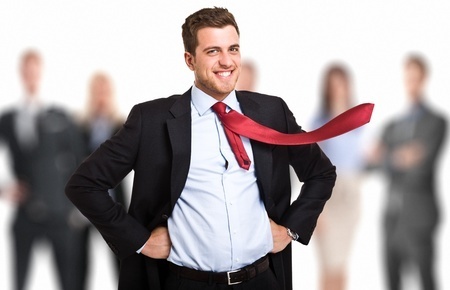 I wrote about this in my blog on using power poses to achieve amazing presence. More recent research has revealed problems in replicating Cuddy's findings. On the other hand, I see no harm in assuming powerful poses to help boost your confidence. After all, learning confidence may seem like a mind game, but literally feeling strong can be a great help. So add this approach, if you like, to the five key body language techniques I discuss above. Arm yourself for your important talks with powerful and productive body language. You'll literally stand out from the crowd, in all the right ways.